I have often written about the little village of Doel, which is threatened to be demolished for the expansion of the port of Antwerp. 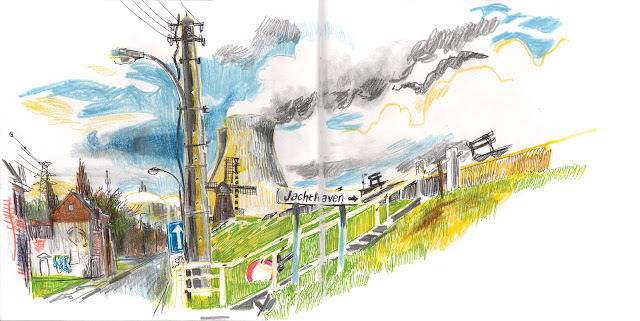 There is one building in Doel they can't demolish, it's the big nuclear power plant just north of the village. But the Belgian government, before the last elections, promised to close the plant, for there are some security problems. The plant has been designed to be active for 40 years, but this term already has expired for many years. Due to some obscure reasons (I guess *money*) the leading party of the government, has decided not to close the installations, and prolong their activity for many years. Last week the government announced every person in Belgium who lives in a risk zone, this is less than 50 km. 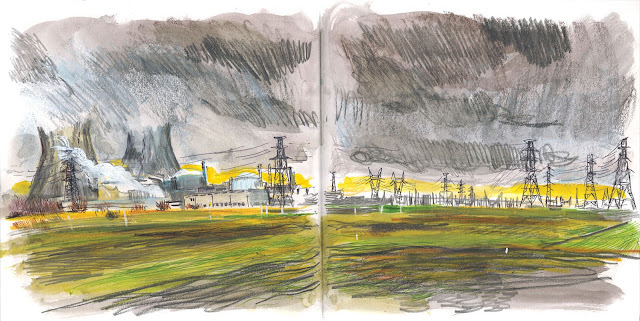 from a nuclear power plant (99% of the Belgian population) can get iodide tablets for free. When going to Doel last weekend, I forgot again to go to the pharmacy to get my portion. But ... I don't know if it would have sense: I heard the most effective protection is to take the tablets three hours before a nuclear accident. So I act like the government, close my eyes for the danger, and enjoy the sun which appears from behind the rain clouds and make some drawings.